Through the Citi Rewards Program, collect 2 Citi Miles on every US dollar of purchases in foreign currency and 1.5 Citi Miles on every US dollar of purchases in AED. 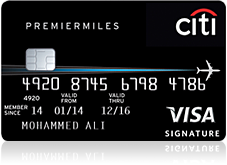 Your Citi Miles never expire. Transfer your ThankYou ® Points to participating travel loyalty programs to redeem for flights, hotel stays and more on a 1:1 basis with select partners, giving you the best conversion rates without being tied down to any given program. Unlimited complimentary access to 1,000+ airport lounges worldwide for you and your supplementary cardmembers.